A design project is not just an opportunity to create something beautiful; it’s a chance to make the world a better place. Creating an environment that users feel connected to and which recognises their individual needs, a space where they feel safe, that fosters their ability to thrive and learn – all these responsibilities are in the hands of the interior designer. At SBID we believe in creating opportunities: for our members, for emerging interior designers and for the public. That’s why we launched initiatives such as our Councils, which aim to share best practice and research on education, healthcare and colour in the interior design sector. By acting as knowledge exchange platforms, the Councils help to ensure that the spaces designers create are fit-for-purpose and maximise opportunities for the people that use them. Our annual 20:20 Meet the Buyer Event is a unique chance for designers and manufacturers to meet face to face and forge relationships. Each year, the SBID International Design Awards allows the global interior design industry to come together to celebrate some of the best creativity in the world. Our student competitions give interior design students unrivalled access to career-enhancing opportunities, from industry mentoring to a £30,000 cash prize to kickstart their creative career. 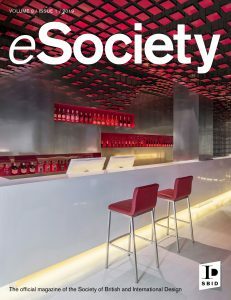 This issue of eSociety is very much in this spirit of creating opportunity, for example highlighting the work and depth of knowledge of our three Councils: Education. Colour and Healthcare. On page 42 you can find out how learning spaces can be welcome spaces for users with autism while the following pages shed light on colour theory and the importance of getting wayfinding right in residential care settings. On page 15, read our interview with art curator Alexandra Schaffer to learn how well curated art can transform an interior space and create financial as well as cultural value.